Apr 21, 2004 — A tailor from Czechoslovakia arrives in America before World War I, leaving his wife and five children behind until he finds work. A bookbinder artist from Poland settles in New York City’s Lower East Side in 1947, just after World War II, and teaches himself English. And a Hungarian family escapes to America via Vienna and Rome in 1980, eventually reaching Queens, where they share an apartment with 11 people. 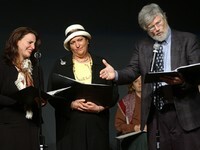 These and other historical and literary readings of poems, short stories, and skits brought Jewish American history to life in “Bundles Hopes and Dreams: Jewish Immigrant Stories,” organized by Peninnah Schram, professor of speech and drama at Stern College for Women, and Pearl Berger, Yeshiva University dean of libraries. The April 20 program, held at the Geraldine Schottenstein Cultural Center on the Israel Henry Beren Campus, commemorated 350 years of Jewish immigration to America, when 23 Jews from Brazil arrived in the town called New Amsterdam in 1654. Each reading depicted the hopes and struggles of Jewish immigrants: from learning English to adapting to a foreign culture while preserving their own native traditions amid America’s melting pot. YU President Richard M. Joel set the evening’s tone, reading “The New Colossus,” Emma Lazarus’s classic poem inscribed on the pedestal of the Statue of Liberty. He used Lazarus’s words as a backdrop to champion American ideals of freedom, opportunity, and hope for the oppressed.